Located on the border of Austria in the northeastern part of Italy, Veneto is comprised of 7 provinces: Belluno, Padova, Rovigo, Treviso, Venezia, Verona and Vicenza. Originally settled by a population of peaceful farmers, agriculture remains a backbone to Veneto’s economy, as well as the steady influx of tourists and visitors to this stunning and diverse region. Veneto includes an extensive plains area that is part of the Po Valley, the sandy beaches of the coastline and the stunning Dolomite Mountains. However, the main draw of the region remains the famous city of Venice, the capital of Veneto. The region is fiercely independent and deeply proud of its heritage; most of the population speaks Venetian as well as Italian, and there is a stirring undercurrent of regional honor that stemmed a political effort to establish Veneto as autonomous from Italy. It is not hard to understand the loyalty and pride of the Venetian people: the lagoons and rivers moving to the Adriatic Sea, the omnipresent wonder of Venice, the rise from one of the poorest regions in Italy to one of the wealthiest, the birthplace of Romeo and Juliet – Veneto has much to be proud of, and offers a wealth of sights to experience and explore. 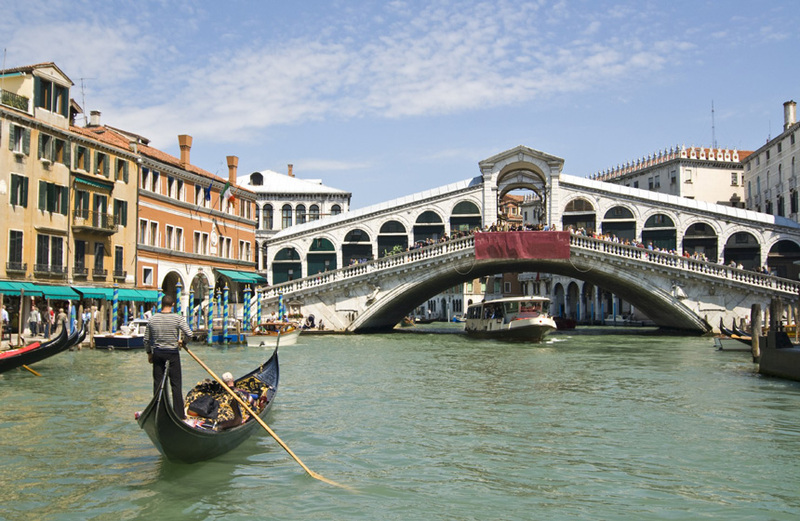 Renowned as one of the most beautiful cities in the world, Venice is famed for romantic gondola rides beneath the bridges of the hundreds of canals that link the waterways of the city. Now the largest pedestrian-only city in Europe, the city was first settled by people seeking refuge from attacks by the Huns in the lagoons of the Venetian Marsh. Small villages were built on 118 small islands but, as the population swelled, wood pilings were added beneath the buildings and homes to reinforce what would become the ‘floating’ city. From this inauspicious beginning, Venice became a prosperous and powerful port, holding a monopoly on trade in the Mediterranean with an impressive fleet of ships. Though the city suffered following a 30-year war with the Turks and was devastated by the plague, which killed a third of the population, Venice recovered to become a popular destination for tourists and artists alike. However, in 1966 a flood threatened the fragile city and subsequently major renovations to the existing wood pilings have helped to sustain the enduring fascination of Venice. As one of Italy’s most significant cities, Venice is flush with historical landmarks and architectural masterpieces, not to mention the stunning canals, islands and lagoons within and surrounding the city. The Grand Canal runs through the heart of Venice and is considered the main canal, lined with palaces from the 1100-1800’s. Stretched over the Grand Canal is the most famous of Venice’s 400 bridges, the Rialto Bridge, which was built during a competition in the 1500’s and is now the heart of the city’s shopping district. Perhaps the most famous landmark is the Basilica San Marco, located in the Piazza San Marco (Saint Mark’s Square), considered to be the center of the bustling life of Venice. The Basilica houses remarkable mosaics, hundreds of treasures and affords a breathtaking view of the city and it’s surrounding area. While exploring the square, be certain to indulge in a coffee at Florian’s Café, Italy’s oldest coffee bar. The museums of Venice are too numerous to name but have wonderful and diverse offerings. There are also several palaces and mansions, including the Palazzo Mocenigo, the Ca’ d’Oro (Golden House) and the Ca’Rezzonico, which are open to the public and are stunning tributes to the decadent and luxurious lifestyle of Venice’s past. But it is the classic gondola ride that completes any visit to Venice, the ‘City of Lights’. Located on the Bacchiglione River, Padua is, at its heart, an old university town brimming with academic, artistic and architectural history. Said to be the oldest city in northern Italy, Padua, or Padova, grew from a small fishing village established by Venetian fishermen to become a rival of Venice, located just 40 kilometers (25 miles) away. While Padua never achieved the trade status of Venice, the founding of it’s university in 1222 shaped the academic, and artistic, history that would be the city’s backbone. Among the illustrious academicians who studied and taught at the university, Galileo and Copernicus were perhaps the most famous and demonstrated the scientific and cultural liberty of the school. Many famed artists studied there as well, including Giotto, whose fresco cycle at the Scrovegni Chapel in Padua (Arena Chapel) is considered one of the world’s most significant artworks. The world’s oldest botanical garden, the Orto Botanico di Padova, is located on the campus as well. Like Venice, the many bridges of the city are one of it’s trademarks, crossing the fingers of the Bacchiglione River. 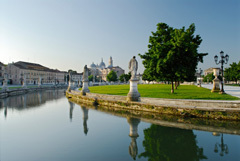 As is evident by it’s prestigious history, there is much to see in Padua. The churches alone would provide enough art and architectural fodder for many return trips; the Basilica di Sant’Antonio da Padova is perhaps the most famous of Padua’s churches. There are remarkable statues, carvings and no less than seven cupolas to explore within “Il Santo”, as the church is known among locals; Donatello’s famed equestrian statue of Gattamelata stands beside Il Santo and is a draw in itself. Several other churches bear mentioning, including the uniquely designed octagonal San Gaetano, Padua’s oldest church Santa Sofia, the Church of the Eremitani, which was virtually demolished in World War II but whose monastery is now an art gallery, and the Santa Giustina Basilica. Padua also has stunning architectural offerings, including the Palazzo della Ragione, located between the Piazza delle Frutt and the Piazza delle Erbe. A great hall used for conferences and exhibitions, the Palazzo or Salone was originally built as a court but was restructured, showcasing a stunning astrological fresco and a large wooden statue of a horse. As well as providing the setting for Shakespeare’s The Taming of the Shrew, Padua has ignited the intellectual and artistic passion of scholars and artists, and millions of visitors, for centuries. 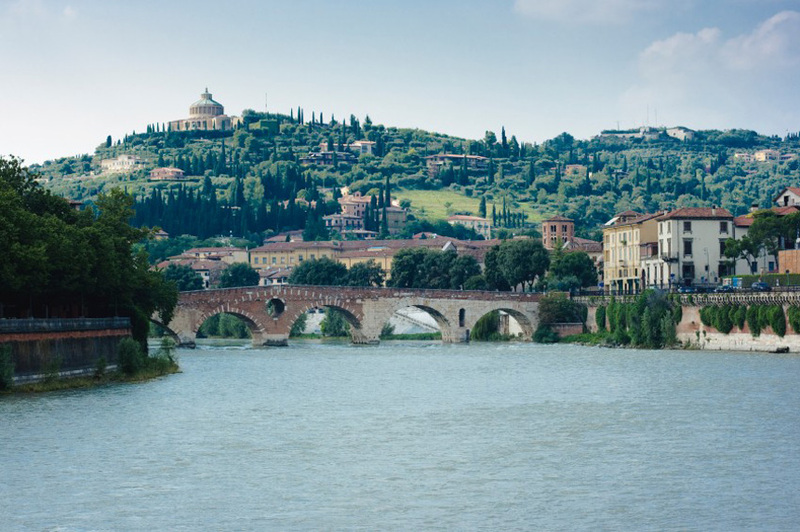 Settled by the Romans in 89 BC, Verona has long been a cultural and economic center, located on the Adige River and in close proximity to Italy’s largest lake, Lake Garda. The city’s location provided abundant trade opportunities and remains today an important trading center, helping Verona to grow to become the second largest city in the Veneto region. The influence of the early Roman rulers is evident throughout Verona, from the orderly blueprint of the grid-like streets to the Piazza Erbe, formed on an ancient Roman forum and the focal point of life in the city. However, the internationally famed Arena di Verona is the most significant landmark, both for it’s incredible scale and it’s remarkable preservation. Built in AD 30, the Arena holds up to 20,000 people and draws fans from all over the globe for it’s immense opera productions in the summer. While Rome’s influence was significant, the Scaligeri family ruled the city peacefully and prosperously for 127 years, beginning in 1263. Their imprint remains in the glorious Castelvecchio castle and in Dante’s epic poem Divine Comedy, which was in part dedicated to the ruling family. Located in the Piazza dei Signori is a statue of Dante, a tribute to his merit among the citizens of Verona. The Castelvecchio caste now houses one of the region’s top art galleries and provides a stunning look at the artwork as well as the architecture of the castle. While the city has a rich history, nothing compares to that of Verona’s most famous citizens, the ill-fated lovers Romeo and Juliet: their tragic love story will forever be synonymous with Verona. Juliet’s tomb, or what is said to be her tomb, remains popular as both a tourist destination and wedding location. Another romantic spot is the Ponte Pietra, an ancient Roman bridge spanning the River Adige, which is illuminated in the evening and is a stunning site. Built in the 11th century and restored, with additional height, in the 15th century, the ‘Tower of the City’, or Torre di Lamberti, is located in the center of the Piazza delle Erbe and is one of Verona’s most famous landmarks. The city is filled with both Roman and medieval architecture, exemplified by the Basilica of San Zeno Maggiore, whose bell tower is named in the Divine Comedy, and the Basilica of San Lorenzo, which includes the prestigious Laurentian Library. Despite all the incredible offerings of the city, it is rarely crowded with tourists, making it a wonderful destination for quiet contemplation of the remarkable artwork, architecture and romantic heritage of Verona. 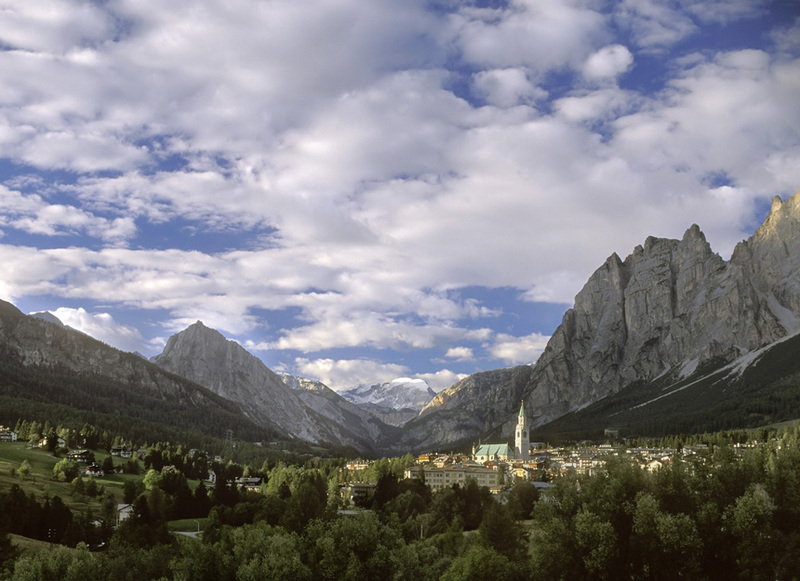 Flanked on almost all sides by the stunning Dolomites, Cortina d’Ampezzo is referred to as “Regina delle Dolomiti”, or Queen of the Dolomites. Located at the heart of the mountain region, Cortina is a world-renowned ski resort that hosted the 1956 Winter Olympics as well as several World Alpine Skiing Championships and World Cup events. It also provided the setting for several famous films, including the James Bond favorite For Your Eyes Only and The Pink Panther with Peter Sellers. Bordered by Austria, the town was passed from Roman rule to the Republic of Venice to Austria until finally joining Italy after World War I. The population boomed once the tourist industry came to the region in the 1950’s, popularizing the town’s stunning vistas and fantastic skiing. Offering 1,220 kilometers (762 miles) of trails, all the area slopes are open to snowboarders and skiers, as well as 117 kilometers (73 miles) of trails for cross-country skiing. There is also great sledding, best enjoyed at night under the stars, and an Olympic bobsled run for the brave of heart. Walkers and hikers also enjoy the abundant forests and mountains surrounding the town. While the slopes are Cortina’s main lure, the shopping, restaurants and ‘après-ski’ scene provide entertainment for those less inclined to hit the mountains. Shopping in Cortina is as much a sport as skiing. Popular names such as Gucci, Bulgari and Benetton can be found as well as sportswear and antiques. The multi-layered shopping center La Cooperative di Cortina, established in 1893, houses a wide array of wares from gift shops to blacksmiths to toys. After a long day in the shops or on the slopes, local restaurants offer everything from seven-course meals to mouth-watering pizza, satisfying all appetites, and wallets. Mountainside huts, or rifugis, are also fun to visit for a bite and a view. For those with energy left, the famous après-ski scene offers discos, piano bars, pubs and clubs, many open to morning hours. With so much to do and see, it is no surprise that Cortina d’Ampezzo is one of the world’s most popular, most scenic and certainly most entertaining resort towns. La Chiesa dei Gesuati o Santa Maria del Rosario is an 18th century Dominican church. It was designed and produced by Giorgio Massari. Construction began in 1725 and was completed and consecrated in 1743. The last statue was placed in 1755, and today the church retains much of what it always has. Basilica di Santa Maria della Salute, otherwise known as the Salute, is an important monument for Venetians, one of the so-called “plague churches.” The church commemorates an annihilating outbreak of plague from 1629-1630, which claimed over 40,000 Venetian lives, nearly a third of the population. Construction began under orders of the Venetian Senate in 1631 as a votive offering to Mary, Our Lady of Health and Deliverance (salute). Architect Baldassare Longhena was commissioned to build it but never saw its completion, as he died five years prior to its unveiling in 1687. Presently, an annual feast is held on November 22, called Festa della Madonna della Salute, in celebration of deliverance from the sickness. Built between 1421-1431, the Ca’ d’Oro (or “House of Gold”) is known as one of the supreme examples of Venetian Gothic design, next to the Doge’s palace. The palace’s original exterior was admired from the Grand Canal, colorfully painted and accented with 24-carat gold, hence its name. Though very little of the original color, decor, or structure remains. It has undergone many restorations. The Palazzo Ducale, or Doge’s Palace, was the hub of Venetian government for several centuries. It stood not only as the residence of the doge, the only elected ruler in Venice, but it also served as the court, the civil administration building, and for a time, the city jail. Originally erected in the 9th century, it underwent many restorations until 1420, when with the help of architect and sculptor Filippo Calendario, the present building was set in stone. Today the magnificent Gothic structure contains relics of the 1100 years of doge rule (697-1797), and is meticulously maintained, often restored. 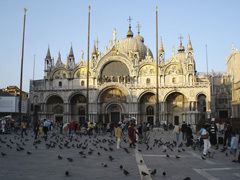 It is conveniently located in Piazza San Marco, adjacent to the basilica. At the southern end of the Venetian lagoon lies a charming seaside town, Chioggia. It calls itself a “little Venice,” though without the countless churches, landmarks and crowds of tourists, Chioggia is hardly reminiscent of the bustling focal point to its north. It is a medium-sized fishing port with one main road which traverses the island north to south and a few key structural attractions. If you want to get away from the madness of Venice and dine on exquisite fresh seafood, check out the peaceful Chioggia. The Venice Lido, or just ‘Lido’, is a short and narrow island which separates the Adriatic Sea from the Venetian lagoon. Starting at the turn of the 20th century, it quickly built a name for itself as a beach retreat, and is now a destination for thousands of sunbathers every summer. It also annually hosts the Venice International Film Festival between August and September. Murano Island is most notable for its role in the history of glass-making. Since 1291, Venice’s premier glassblowers have resided on this tiny island, just 15 minutes off the mainland. It is said that the precious industry was moved to the island due to Venice’s largely wooden architecture of the 13th century, though it is also speculated that glassblowers were quarantined to the island to prevent any cherished glass-making secrets from diffusing outside of Venice. Punishment for leaving the island included death. In return for their exclusive and beloved artistic talents, glassblowers were permitted to marry Venetian nobility, carry swords, and appreciate immunity from legal prosecution. Rare benefits indeed! Today it is a monument to glassblowing. Visit the Museo Vetraio, the glass museum, or one of the contemporary glasswork museums. For a real treat check out the Santi Maria e Donato church. 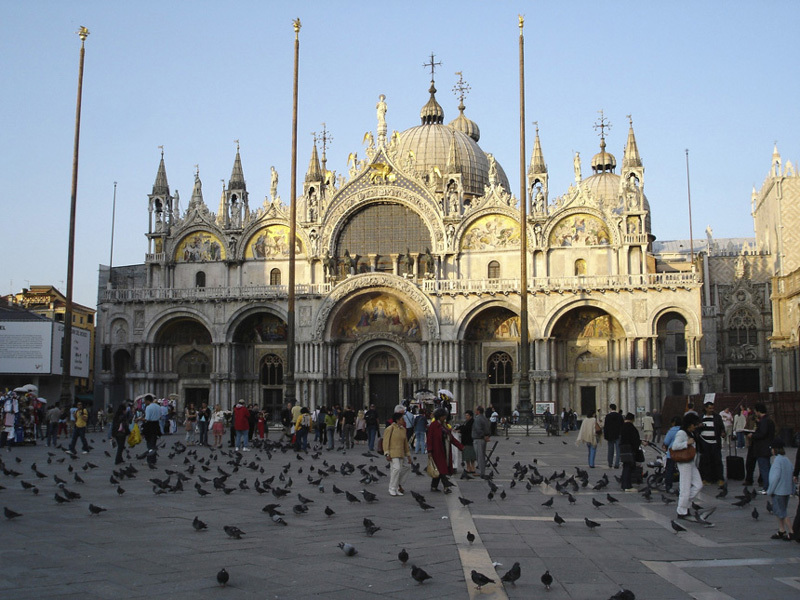 It is a spectacular sight to view the Church of San Giorgio from the Piazza San Marco. The busy square faces the brilliant white façade of the church, situated on the Island of San Giorgio Maggiore. It was designed by Andrea Palladio in 1566, though due to his death in 1580 the structure was not completed until 1610. The church contains a Benedictine monastery and now accommodates art and dance exhibitions. Torcello Island is the farthest from the mainland of the Venetian islands (that tourists ever visit), and its quiet solitude reflects that fact. What was once the main refuge for Venetian residents fleeing Attila the Hun in the 5th century, Torcello is now a very quiet curiosity which echoes its intense past. By the 10th century the population had grown to over 10,000, but by the 12th century the island was sinking into swampland. With less than 20 current residents, it is a shadow of what it once was. Today visitors can see the Cathedral of Santa Maria Assunta, the Museum of Torcello, and Attila’s Throne. Be warned, nothing comes cheap on this island, though it may be worth it for a peaceful break from Venice life. I Gesuiti is an ornately decorated church with an interesting history. Originally built in the 12th century, the building was claimed and expanded upon in the late 1600s by Jesuits who had been banned from Rome for the last 50 years. Architect Domenico Rossi was hired to oversee the construction, and by 1729 the church was complete. This unique church is greatly embellished with gold stucco, colored marble, reliefs, sculptures and breathtaking murals. La Chiesa della Madonna dell’ Orto was originally named San Cristofaro out of dedication to St. Christopher, but when the “miraculous” image of the Virgin Mary that had been found in the vegetable garden (il orto) was installed in the building, the name was changed out of divine inspiration. Reconstruction of the 14th century building began in the 1400s and continued throughout the century. The Church of Santa Maria Formosa was erected from a 7th century church by architect Mauro Codussi in 1492. The name is speculated to derive from a legendary appearance of the Virgin Mary herself in the square as a voluptuous (formosa, in Italian) woman. The Church of San Sebastiano is a little-known treasure in Venice. A former hospice, the present day church is a symbol of strict Renaissance architecture, completed in the 1550s by Antonio Abbondi, better known as Scarpagnino. The church is almost exclusively adorned with works by artist Paolo Veronese, who is buried in the nearby presbytery. The church is an almost chronological trail of Veronese’s artistic experience through life. San Sebastiano is located on the banks of the Rio di San Sebastiano, in the Dorsoduro district.